¥ First Lieutenant Gresham, J. C.: [On duty with Troop]. Second Lieutenant Bullock, E. C.: Relieved from Special Duty as Post Canteen Officer Nov. 1, 90, Ft. Riley, Kas. Relieved from Special Duty. as A.O.O. Nov. 1, 90, Ft. Riley, Kas., Appointed Post Trainer and Detailed in charge of Post Mess Hall and Garden, Nov. 1, 90, Ft. Riley, Kas. Relieved from Special Duty as Post Treasurer and from charge of Post Mess Hall and Garden Nov. 23, 90, Ft. Riley, Kas. Absent sick at Ft. Riley, Kas. since Dec. 1, 90. * Sergeant Toohey, William H.: Enlisted on May 27, 89 at Fort Riley, Kansas, by Lt. McCormick. Sick in Hospital gunshot wound right leg received Dec. 29, 90 in action with Hostile Indians in line of duty. Sergeant Leach, Michael: Enlisted on Aug. 9, 90 at Fort Riley, Kansas, by Lt. McCormick. * ¥ Sergeant Ward, James: Enlisted on Aug. 14, 88 at Boston, Massachusetts, by Capt. Miller. Sick in Hospital. Knife wound right shoulder received Dec. 29, 90 in action with Hostile Indians in line of duty. Sergeant Brown, James H.: Enlisted on May 21, 86 at Cincinnati, Ohio, by Lt. Edwards. Corporal Dupree, Willis R.: Enlisted on Feb. 2, 87 at Washington, District of Columbia, by Capt. Leatt. ¥ Corporal Capron, Harry W.: Enlisted on Aug. 3, 88 at Jefferson Barracks, Missouri, by Lt. Fountain. Appointed Corporal Nov 28, 90, fined by General Court Martial to forfeit to U.S. one dollar ($1.00) of his pay per Field Order 10, Pine Ridge Agency, S.D. Dec. 15, 90. Awarded a Certificate of Merit, June 25, 91. Trumpeter Hickey, Charles: Enlisted on Mar. 10, 90 at Boston, Massachusetts, by Capt. Kendell. Assigned to Troop per Order 204, Headquarters Recruiting Station Oct. 21, 90. Joined Nov. 2, 90, appointed Trumpeter per Order 14. Sick in Hosp. Dec. 11 to 16, 90, acute Rheumatism contracted in line of duty. Saddler Bailey, John A.: Enlisted on Jan. 5, 86 at Fort Yates, Dakota Territory, by Lt. Mann. Farrier Johnskoski, Frank: Enlisted on Mar. 18, 86 at Detroit, Michigan, by Capt. King. Appointed Farrier Nov. 1, 90 per Troop Order 15. Blacksmith Heluisen, William F.: Enlisted on Sep. 23, 86 at Washington, District of Columbia, by Capt. Scott. Wagoner Zeck, Firrio E.: Enlisted on May 17, 90 at Cincinnati, Ohio, by Capt. Harris. Private Anway, Charles: Enlisted on Apr. 29, 90 at Lansing, Michigan, by Capt. Nowlan. Private Arlinghaus, Benjamin: Enlisted on May 27, 89 at Cincinnati, Ohio, by Capt. Ropis. Private Bartlett, George: Enlisted on Jun. 13, 90 at Elmira, New York, by Lt. Morton. Assigned to Troop per Order 88, Hdqrs. 7th Cav. Dec. 6, 90. Private Bowling, Richard H.: Enlisted on Apr. 22, 90 at Washington, District of Columbia, by Capt. Gibson. Private Cain, Francis P.: Enlisted on Dec. 12, 88 at New York, New York, by Capt. Waynn. Private Carlisle, Roger E.: Enlisted on Apr. 11, 90 at Chicago, Illinois, by Lt. Webster. Private Crinch, Charles: Enlisted on Apr. 17, 89 at Philadelphia, Pennsylvania, by Lt. Dodd. Private Crutchman, Charles: Enlisted on Oct. 2, 86 at Baltimore, Maryland, by Capt. Overton. Reverted to Pvt. from Farr. Nov 1, 90, per troop Order#15. Company cook since Dec. 1, 90. Private Dailey, Michael: Enlisted on Apr. 12, 86 at Boston, Massachusetts, by Capt. Ewers. Private Davis, Henry C.: Enlisted on Sep. 29, 82 at Fort Douglas, Utah, by Lt. Orewell. Reverted to Pvt from Corporal Nov. 28, 90, per Order#85 Hdqrs. 7th Cavy. Making good time lost by desertion, term of service expires Dec. 3, 91. Private Dwork, Emil: Enlisted on Apr. 22, 90 at Milwaukee, Wisconsin, by Capt. Harris. Private Fay, Charles L.: Enlisted on Nov. 21, 87 at Fort Meade, Dakota Territory, by Lt. Bullock. On furlough since Nov. 21, 90, under provision of General Order#80 A.G.O. Private Galler, Joseph: Enlisted on Apr. 1, 89 at Baltimore, Maryland, by Capt. Huggins. Private Gardner, Miles M.: Enlisted on Sep. 26, 90 at Fort Riley, Kansas, by Lt. McCormick. Private Glazier, Benjamine: Enlisted on Jun 16, 90 at Detroit, Michigan, by Lt. Lockett. Private Graves, John E.: Enlisted on Mar. 5, 90 at Providence, Rhode Island, by Capt. Thompson. Private Hackett, John: Enlisted on Jan. 1, 88 at Fort Douglas, Utah, by Lt. Fury. On Detached Service at Army and Navy Hospital Hot Springs, Ark. Since August 4, 90, with mercurial Rheumatism not contracted in line of duty. * ¥ Private Hillock, Marvin C.: Enlisted on Mar. 11, 90 at Detroit, Michigan, by Lt. Lockett. Sick in quarters. Gunshot wound, left food received in action Dec. 30, 90. Private Hirtz, William J.: Enlisted on May 2, 87 at Fort Buford, Dakota Territory, by Lt. McGurrigle. Relieved from Extra Duty in Quartermaster Department Nov. 23, 90. Private Huntington, Warren W.: Enlisted on Aug, 21, 90 at Augusta, Montana, by Lt. Mortin. Assigned to troop per Order#88 Hdqrs. 7th Cavy. Joined Dec. 6, 90. Private Kelley, John: Enlisted on Feb. 6, 89 at Providence, Rhode Island, by Lt. Hutton. Private Kirkpatrick, Alvey M.: Enlisted on Sep. 30, 90 at Saint Louis, Missouri, by Capt. Kauffman. Assigned to Troop per Order#88 Hdqrs. 7th Cav. Joined Dec. 6, 90. * Private Kirkpatrick, Wm S.: Enlisted on Sep. 30, 90 at Saint Louis, Missouri, by Capt. Kauffman. Assigned to Troop per Order#88 Hdqrs. 7th Cav. Joined Dec. 6, 90. Sick in Hospital with gunshot wound right leg received Dec. 30, 90 in action with Hostile Indians, in line of duty. Private Kohlech, Ferand: Enlisted on Nov. 3, 87 at Philadelphia, Pennsylvania, by Lt. Scott. On furlough since Nov. 5, 90 under provision of General Order#80 A.G.O. Private Lester, Charles A.: Enlisted on Sep. 8, 88 at Jefferson Barracks, Missouri, by Lt. Fountain. On Special Duty as Company Cook since Dec. 1, 90. * Private Lewis, Francis: Enlisted on Apr. 13, 86 at New York, New York, by Capt. Steadman. Sick in Hospital with gunshot wound right hand received Dec. 29, 90 in action with Hostile Indians in line of duty. Private McKerigan, John: Enlisted on Jul. 6, 88 at Boston, Massachusetts, by Capt. Miller. Relieved from Special Duty in Post Garden at Fort Riley, Kansas, Nov. 23, 90. * Private McKenzie, John: Enlisted on Mar. 25, 90 at Washington, District of Columbia, by Capt. Gibson. Sick in Hospital with gunshot wound left shoulder received Dec. 29, 90 in action with Hostile Indians in line of duty. Private Miller, Erush: Enlisted on Sep. 13, 87 at Saint Louis, Missouri, by Capt. Smith. Private Miles, George D.: Enlisted on Apr. 9, 89 at Fort Riley, Kansas, by Lt. McCormick. On furlough from Nov. 12 to 30, 90. On Detached Service at Ft. Riley, Kas. Since Dec. 1, 90. Private Perry, Edward M.: Enlisted on Sep. 11, 90 at Albany, New York, by Capt. Patterson. Assigned to Troop per Order#88 Hdqrs. 7th Cav. Dec. 6, 90. Private Phelps, Alfred D.: Enlisted on Nov. 19, 88 at Springfield, Massachusetts, by Capt. Ropis. On Detached Service at Ft. Riley, Kas., since Nov. 24, 90. Private Ritthanover, Baleslous: Enlisted on Nov. 20, 88 at Newark, New Jersey, by Lt. Carter. Private Ryan, Thomas: Enlisted on May 1, 89 at Jefferson Barracks, Missouri, by Lt. Sands. Private Scarlett, Michael S.: Enlisted on Aug. 9, 87 at Philadelphia, Pennsylvania, by Lt. Scott. To forfeit to the U.S. $3.00 per Order#253 Fort Riley, Kas. Tried by Summary Court Martial sentenced to forfeit to the U.S. $5.00 per field Order#10 Pine Ridge Agency, S.D., Dec. 15, 1890. Private Smith, Edward: Enlisted on Jun. 21, 90 at Boston, Massachusetts, by Capt. Kendall. Transferred from Troop A, 7th Cav. Dec. 13, 90 per Order#91 Hdqrs 7th Cav. Private Smith, John W.: Enlisted on Dec. 8, 84 at Fort Meade, Dakota Territory, by Lt. Wilkenson. On Special Duty as Cook for Officers Mess since Dec. 1, 90. Making good time lost by desertion, term of service expires Jan. 29, 90. Private Spinner, Philip: Enlisted on Jan. 25, 86 at Fort Leavenworth, Kansas, by Lt. Macklin. On Special Duty as Company Baker since Dec. 1, 90. Private Thompson, Harry R.: Enlisted on Aug. 25, 90 at Newark, New Jersey, by Capt. Cooper. Assigned to Troop per Order#88 Hdqrs. 7th Cav. Dec. 6, 90. Private Van Fossin, Edwin F.: Enlisted on Feb. 11, 89 at Philadelphia, Pennsylvania, by Lt. Dodd. Tried by Summary Court Martial. Sentenced to forfeit to the U.S. $3.00 per Order#4, Pine Ridge Agency, S.D., Dec. 6, 90. Private Varney, Arthur: Enlisted on May 27, 89 at Fort Riley, Kansas, by Lt. McCormick. To forfeit to U.S. $3.00 per Order#259 Fort Riley, Kas. Private Webster, John H.: Enlisted on Feb. 14, 89 at Milwaukee, Wisconsin, by Capt. Budd. On Special Duty as Clerk in Regimental Commanders Office. Private Wright, George: Enlisted on May 13, 90 at Flushing, Michigan, by Capt. Nowlan. Private Wright, Grant: Enlisted on Feb. 16, 89 at West Point, New York, by Lt. Johnston. Sick in Hospital from Dec. 5 to 15, 90, contusion head contracted in line of duty. Private Mezo, William S.: Enlisted on Sep. 30, 90 at Saint Louis, Missouri, by Capt. Kauffman. Assigned to Troop per Order#88 Hdqrs. 7th Cav. Joined Dec. 6, 90. [also listed below under Killed in Action]. Private Kelley, John W.: Enlisted on Sep. 23, 90 at Cleveland, Ohio, by Capt. Carpenter. Assigned to Troop per Order#88 Hdqrs. 7th Cav. Joined Dec. 6, 90. [also listed below under Loss by Transfer]. Private Kelley, John W.: Enlisted on Sep. 23, 90 at Cleveland, Ohio, by Capt. Carpenter. Transferred to Troop A, 7th Cav. Dec. 13, 90 per Order#91 Hdqrs. 7th Cav. Clothing account never settled. Total money value of clothing drawn since enlistment $80.27. § First Sergeant Coffey, Dora S.: Enlisted on Dec. 22, 86 at Chicago, Illinois, by Capt. Hermisces. [Killed in action] Dec. 29, 90, in Wounded Knee Creek, S.D., by Hostile Indians. Due Soldier for clothing not drawn $35.66. § Corporal Forrest, Harry R.: Enlisted on Apr. 9, 88 at Camden, New Jersey, by Lt. Hoyle. [Killed in action] Dec. 29, 90, in Wounded Knee Creek, S.D. by Hostile Indians. Due Soldier for clothing not drawn $10.77, appointed Corp. Nov. 28, 90 per Order#85 Hdqrs 7th Cav. § Private Cook, Ralph L.: Enlisted on Aug. 21, 88 at Chicago, Illinois, by Capt. Gardner. [Killed in action] Dec. 29, 90 in Wounded Knee Creek, S.D. by Hostile Indians. § Private Costello, John: Enlisted on Dec. 27, 87 at New York, New York, by Capt. Jackson. [Killed in action] Dec 29, 90 in Wounded Knee Creek, S.D., by Hostile Indians. Due to Soldier for clothing not drawn $33.64. § Private Mezo, William S.: Enlisted on Sep. 30, 90 at Saint Louis, Missouri, by Capt. Kauffman. Assigned to Troop per Order#88 Hdqrs. 7th Cav. Joined Dec. 6, 90. [Killed in action] Dec. 29, 90 in Wounded Knee Creek, S.D. by Hostile Indians. Private Platt, Thomas: Enlisted on Sep. 30, 87 at Milwaukee, Wisconsin, by Lt. Garritty. At Pine Ridge Agency S.D. under paragraphs of General Order#80 A.G.O. Character Excellent. Private Miller, Frank A.: Enlisted on Aug. 19, 87 at Chicago, Illinois, by Capt. Hermisces. Discharged at Fort Riley, Ks. Nov. 18, 90, under provision of paragraph 2 General Order 80 AGO 1890 per Special Order No. 148 Dept. Mo. 1890 – Discharge and final statement sent to Evanston, Wyo. Character Excellent. Due soldier retained pay $18.00 for clothing $15.30 Due U.S. Camp equipage $1.35 – a single man ride 201/15 P.R.D. 1891. The Recapitulation and Record of Events Page of B Troop, 7th Cavalry Regiment’s Muster Roll of December, 1891. December 1890. Remained in Camp at Pine Ridge Agency, S. D., until the 26th when the Troop marched 18 miles camping on Wounded Knee Creek, S. D. Attacked by Big Foot’s Band of Hostile Cheyennes while disarming them, Dec. 29, 90, engaged them and killed about 100 Braves. Our loss 1 First Sergt., 1 Corp. & 2 Prvts., killed, wounded 1 Corporal & 3 Prvts, same day returned to agency where the Troop has since remained. Dec. 30, pursued Band of Hostile Indians & engaged them about 6 miles from camp. 2 Prvts. wounded. 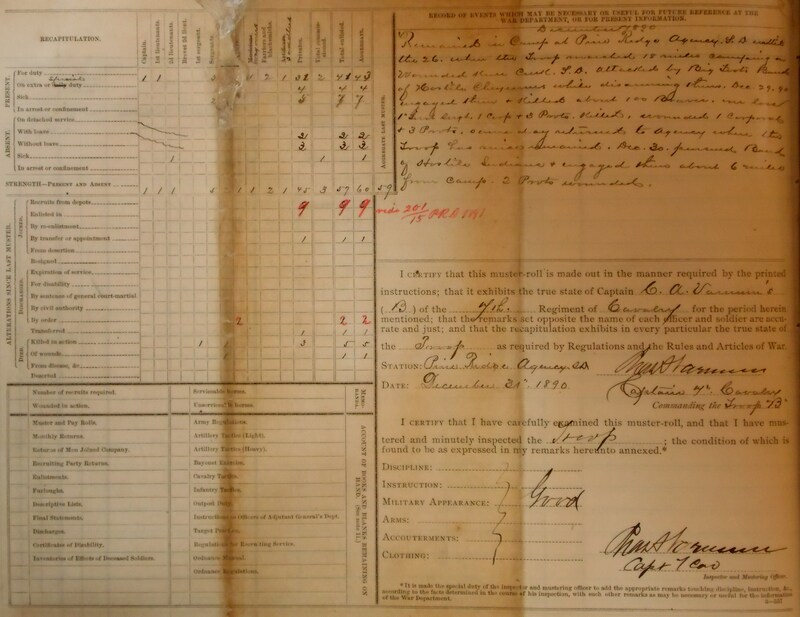 Source: Adjutant General’s Officer, “7th Cavalry, Troop B, Jan. 1885 – Dec. 1897,” Muster Rolls of Regular Army Organizations, 1784 – Oct. 31, 1912, Record Group 94, (Washington: National Archives Record Administration). This entry was posted in Muster Rolls, Official Reports and tagged 7th Cavalry, 7th Cavalry Regiment (United States), Big Foot, Cavalry, Cavalry Troop, Chrarles Varnum, Drexel Mission, James Forsyth, Pine Ridge, Pine Ridge Agency, Pine Ridge Indian Reservation, United States Military Academy, White Clay Creek, Wounded Knee, Wounded Knee Creek, Wounded Knee Massacre. Bookmark the permalink.